Attention Bowling Pro Shops, Coaches, and Serious Bowlers! Do you ever wonder why you just can't seem to grasp the intricacies of layouts and ball motion? Are you sick and tired of the rampant confusion and endless contradictions surrounding ball drilling methods? Powerhouse Blueprint is the answer, providing you with the knowledge and tools you need to layout and drill bowling balls with the ultimate in precision and accuracy! Get a Free Trial	Order Now! 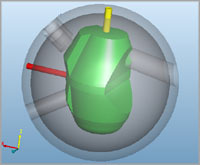 Powerhouse Blueprint takes the guess work out of ball drilling. Provide your customers with the perfect ball reaction...quicker, easier, and more accurately than ever before! WARNING: What you don't know about bowling balls, core dynamics, layout methods, and on-lane motion CAN hurt you! Let's Face It: Today's Game Can Be Pretty Complicated! Things used to be much simpler. Do you ever feel like the guy on the right? Quite simply, the knowledge and skills of yesteryear are no longer sufficient for today's top competitors. If you're ready to take the next step, then keep reading to learn how Blueprint can revolutionize your knowledge of the modern game and give you the advantage you've been searching for. 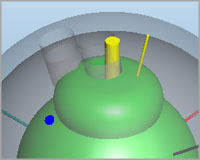 Virtual bowling ball drilling: Simulate different layouts in 70+ real-world bowling balls to see how layouts, grip parameters, and balance holes affect the RGs and differentials. 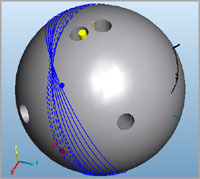 On-lane bowling ball motion simulation: Virtually throw shots on different lane surfaces and oil patterns to see how things like layouts, coverstock surface finish, and bowler delivery parameters affect ball motion. Powerhouse Blueprint was introduced to the bowling world at the 2011 International Bowl Expo trade show in Dallas, Texas. Blueprint is a one-of-a-kind program with no equals, painstakingly developed over many years by a diverse team of bowling, engineering, and software development experts. The short answer is this: Blueprint can make you better at what you do. Whether you're a ball driller, a bowling coach, or a competitive tournament bowler, Blueprint gives you the tools and knowledge needed to elevate your skills, make better decisions, and help you beat your competition. Blueprint helps you "untangle the knot" of the modern sport of bowling. Blueprint is packed with powerful tools to help you elevate your skills to new levels. Keep reading to see more details about some of Powerhouse Blueprint's best benefits. See how different bowling balls react to different layouts. 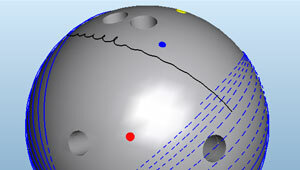 Experiment with balance holes to fine-tune ball motion. Determine the best location and best size for each specific purpose. 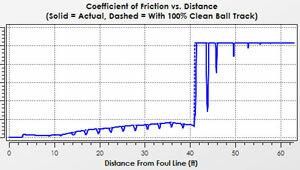 View the ball's predicted mass properties AFTER drilling, which is really what matters when it comes to on-lane motion. 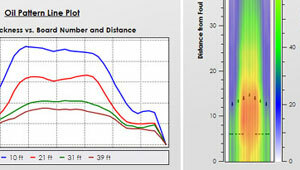 See how the low and high RG axes shift during drilling. Make sure your layouts are flare-safe...no more bouncing over the holes! Improve the layouts you use on bowlers with unconventional PAPs...with Blueprint, there's no need to stick to overly-conservative rules of thumb. Push the limits of layouts in ways that are only limited by your imagination. Want to use a 120 degree mass bias angle? 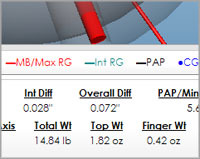 Want to use a 6 1/2 inch pin-to-PAP distance? Want to use a 5 degree VAL angle? Want to put a balance hole 6 inches below the thumb hole? With Blueprint, you can do all of this and then verify that the drilling is flare-safe! 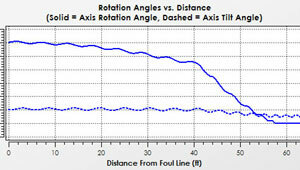 Visualize the ball's RG contour plot to better understand how the ball's axis of rotation will migrate when thrown. See how different layouts affect the ball's on-lane reaction. Want a balance hole that maximizes the ball's hook? Use Blueprint to figure out exactly where to put it and how big to make it! Want to try an unconventional layout or balance hole? Blueprint shows you how the ball will react...and whether or not it will flare over any of the holes. Get to know the coverstock characteristics of all the balls in all four Ebonite International bowling ball lines. Curious how the Columbia 300 Wicked Encounter compares to the Track 503T? 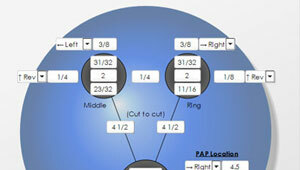 Blueprint will show you how different balls compare! 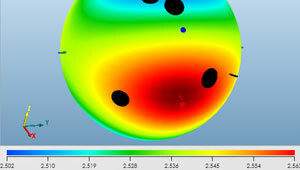 See the impact of coverstock surface changes on ball reaction. Wonder what might happen if you take your ball from 4000 grit to 500 grit? With Blueprint, you can find out with just a couple of clicks of the mouse. 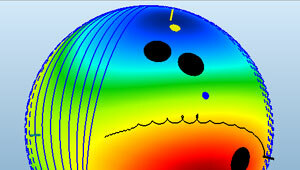 Simulate different bowler delivery parameters. How much will 20 degrees of extra axis rotation angle impact your shot? What will an extra 50 RPM do for your game? How does ball speed affect the ball path? 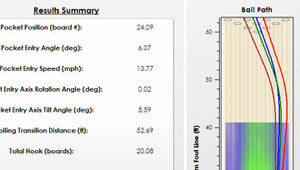 See how different oil patterns and lane surfaces affect the ball's transitions. With nearly 50 oil patterns and three types of lane surfaces, Blueprint can help you understand how to succeed in a wider variety of environments. A winning combination: Powerhouse Blueprint and the best brands in bowling! The current bowling ball library contains 14 pound, 15 pound, and 16 pound versions of nearly all Ebonite International bowling balls released since 2011. This diverse collection includes balls with an extremely wide variety of core shapes, RGs, total differentials, intermediate differentials, and coverstock types. Kegel Bowling Solutions: All the popular patterns from the Recreation series, Challenge series, and Sport series. 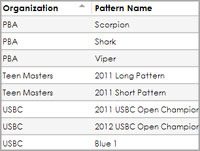 Professional Bowlers Association: All of the PBA's animal-series patterns, including Cheetah, Chameleon, Scorpion, Shark, and Viper. 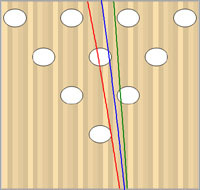 United States Bowling Congress: USBC's White and Blue patterns; patterns for popular tournaments such as the USBC Open Championships. World Tenpin Bowling Association: WTBA's new city-named patterns, including Athens, Beijing, Los Angeles, Mexico City, Paris, Seoul, Tokyo, and many more! Numerous typical house shots are also included: Want your house shot included in Blueprint? Just send us an email and we'll do our best to get it added! We are so confident that you will absolutely love Powerhouse Blueprint and the countless benefits it provides that we want you to try Blueprint for free before buying. Our free time-limited trial version gives you the opportunity to "kick the tires" and explore Blueprint's powerful features for yourself. 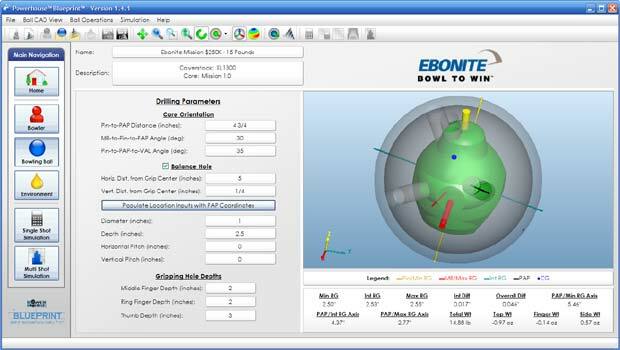 Besides limiting the number of bowling balls to four (one from each Ebonite International brand), the free trial gives you the same set of features as the full version. To get started with your free trial, click here. Ready to Join the Blueprint Revolution? Powerhouse Blueprint has forever changed the way people think about ball drilling and ball motion. Decades-old theories and beliefs are being debunked thanks to the sophisticated level of analysis provided by Powerhouse Blueprint. Are you ready to experience Powerhouse Blueprint for yourself? Blueprint can be ordered directly from Ebonite International's Powerhouse division by pro shop professionals, bowling coaches, and serious bowlers alike. Please visit our How to Order page for more information and for details of current special offers. Click an image below to see some of Blueprint's most powerful features in action! Special thanks to Bowling This Month and BTM contributor Steve Fuhrman for the comprehensive review of Blueprint in the November 2011 issue. Click the above link to read the review and learn more about Blueprint.